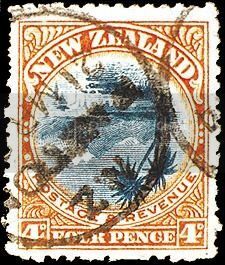 The 4d stamp depicts Lake Taupo in New Zealand's North Island. It was part of the first pictorial series originally issued in 1898 but reissued in different colours and sizes in 1899 and 1900. The same design was used for a 1d value issued in 1898.